A heat pump hot water heater is a new renewable energy efficient way of heating hot water. Typically hot water heaters use an energy source such as gas or electricity to heat stored water, however heat pumps use the heat from the outside air to heat the stored water inside the storage tank. They look very similar to standard conventional electric storage units, however have the heat pump that sits at the top of the tank. How do Heat Pump hot water heaters work? Heat pumps work like a refrigerator but in reverse. Instead of cooling the water (like a fridge) it heats the water. 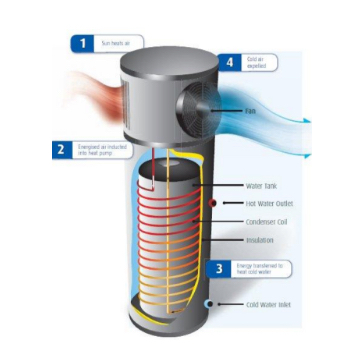 Heat pumps transfer the heat from the outside air around the heater to the stored water inside the tank. It does this via the heat pump and heat exchanger. The heat pump draws air from around the hot water heater via a fan into an evaporator containing an environmentally friendly refrigerant known as R134a (commonly used on air conditioners and refrigeration), which has a boiling point of -25.9C. The outside air temperature contains more than enough heat to cause the R134a to boil and turn into a gaseous state. Once the liquid transforms to a gas, its pumped through a compressor, generating a lot of heat in the gas, then pumped though the heat exchanger (piping around the tank) where the heat from the refrigerant pipework is transferred to the water in the tank. As the heat is transferred from the gas into the water, the gas turns back to a liquid state and the cycle begins again. This simple but effective process allows the water inside the tank to be heated essentially from the outside air. Some heat pumps still utilise electrical elements as boosters, however most current heaters work solely on the heat pump principles. Whilst heat pumps will work in most climate conditions, Precise Plumbing does not recommend installing heat pumps in Rec’s Zone 4, see figure below. Although heat pump hot water heaters will work in these climates, the extended run times of compressors can reduce the cost effectives of the unit and reduced the life expectancy. All other climate zones are typically warm enough to ensure the units work at their maximum efficiency and cost benefits are achieved. Like most things, in the early days heat pumps were extremely expensive, ranging from between $4000-$8000. There were however significant federal and state government rebates in the form of REC’s (Renewable Energy Certificates) and other state specific rebates which significantly reduced the cost of the units and made them competitive. The government program REC’s has since been transferred over to a new program titled STC’s (Small-scale Technology Certificates) with different incentives on offer to consumers. The general prices of Heat Pumps have only reduced slightly over time, but can still be an attractive option when taking into consideration the rebate incentives on offer. Precise Plumbing has extensive experience in correctly matching suitable heat pump hot water heaters to housing requirements and can help take the confusion out of the rebate / legislative requirements. In South Australia, specific legislation had been passed where electric with electric hot water heater replacement were not allowed, therefore any existing electric hot water heater that needed to be replaced must have been with either a Heat pump or Solar Hot water system, which had to meet and achieve specific environmental greenhouse emissions standards. The laws have since changed allowing specific type of electric to electric heater replacements, making heat pumps / solar only mandatory under certain requirements. If considering installing a Heat Pump hot water heater, please contact Precise Plumbing on 08 8152 6740 and we’ll assist in determining what rebates are available and applicable to your situation.